A fun but admittedly bleak game to play while watching the countless movies that depict the impending end of the world (or the disastrous results of coming so close to it), is to ask yourself: Could I survive this? When forced to roam for safety, would you find yourself eating human flesh as the roving cannibals of The Road do, or can you hunt and fish for food just fine? Could you stand to live in a bunker underground or in total isolation up in the woods somewhere? How do you feel about your beloved pets being the first to die, as a pretty much inevitable plot device? But to ask the same questions of A Quiet Place, John Krasinski’s first horror movie, is kind of a laughable exercise. Because despite its effectiveness as a horror film, the movie is also a remarkably quaint, even downright cozy, depiction of what day-to-day life would be like when forced to live alongside bloodthirsty extraterrestrial life who pounce on living creatures the moment they make a noise above a whisper. As you can tell from a New York Post-style daily, flapping in the wind in the movie’s opening scene—with a headline that screams “IT’S SOUND!”—the struggle facing the central family of A Quiet Place is that they must live in near silence, as these creatures hunt with their super-sensitive hearing. Lee (Krasinski), his wife Evelyn (Emily Blunt), and their children walk bare-foot everywhere, they move with slow-motion precision, and the entire family often uses sign language, given that Lee and Evelyn’s oldest daughter Regan (Millicent Simmonds) is deaf. And given the intimacy of the house (the photos on the walls, the perfectly made-up bedrooms), it appears viewers have come across a family who has maybe always lived this way, aliens or not. The movie takes place not even a year after the supposed invasion on a sprawling, Rockwellian farm, complete with plentiful corn fields, a lily-white farmhouse, and a shabby-chic, dried-flower filled barn. Food is not a problem; it looks like they keep hundreds of mason jars filled with canned vegetables in the basement, and one night, dinner is a meal of freshly cooked fish, caught by Lee in a nearby stream. And given the intimacy of the house (the photos on the walls, the perfectly made-up bedrooms), it appears viewers have come across a family who has maybe always lived this way, aliens or not. But with Evelyn twirling around in floral dresses and spotless overalls, it can feel as if you’re watching a horror movie that takes place in an Anthropologie catalogue. In one scene, Evelyn homeschools her son Marcus from what looks like a brand new textbook, the two of them perched on tidy little haystacks in the barn. “Man, they have school, too? !” a teenage boy said, out loud, behind me in the theater. None of this is to say that the life for the family in A Quiet Place doesn’t make for a great horror movie. The film is scary in ways that extend far beyond the difficult constraints of living silently. Krasinski balances out the more jumpy directions of the script with long, tense scenes that would be frightening even without the movie’s monsters, the centerpiece being a moment in which an isolated Evelyn goes into labor (because, yes, in the most utopian dystopia of A Quiet Place, keeping the family growing is a possibility), clinging to the walls and trying not to scream through her contractions. But even then, when the baby eventually comes, Evelyn’s labor happens quickly, quietly, miraculously without medical issues. A Quiet Place stands out as a horror film built not just for the well-prepared, but for those that believe in the resilience of mankind. So it can be hard to ignore the pristine Swiss Family Robinson-style survivalist set pieces of A Quiet Place. But watching it, I was reminded of all the other horror movies that tread similar territory but with a far darker touch. 2017's It Comes At Night focuses on a similarly reclusive family fending for themselves at the edge of the world, but their story culminates in almost unbearably depressing, deadly human violence. In 2016's 12 Cloverfield Lane, a well-stocked underground bunker appears to be a safe haven for its woman lead, but the misogyny of the man who created it and keeps her there proves that while a lifetime supply of food and comfort can eliminate some basic problems, it won’t eliminate the ill will of men. In a year when doomsday prepping has escalated to its own cottage industry, and we may be closer to that day than ever before, A Quiet Place stands out as a horror film built not just for the well-prepared, but for those that believe in the resilience of mankind. 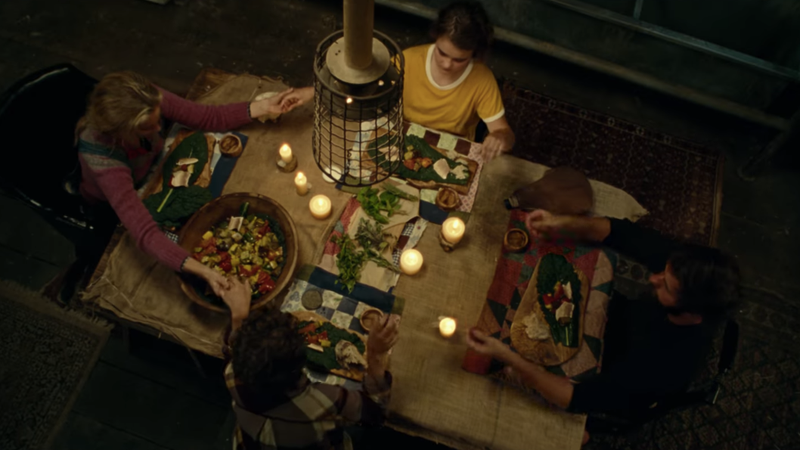 Where most movies in this genre have chosen to cynically highlight the ways in which humans will destroy and hurt each other in times of weakness, A Quiet Place conservatively suggests that the bonds of the well-rounded, all-American family unit can survive even the most brutal circumstances. Correction: A previous version of this post incorrectly identified A Quiet Place as John Krasinski’s directorial debut.